IRIDA is a visualization protocol for Wireless Sensor Network research and prototyping. It has been developed at the TCS/Sensor Lab of the University of Geneva by Marios Karagiannis. With IRIDA you can visualize most aspects of WSN operation in real time for debugging or demoing purposes alike. The protocol is platform agnostic and modular. Irida is the modern greek word for Iris. According to Wikipedia, the iris (plural: irides or irises) is a thin, circular structure in the eye, responsible for controlling the diameter and size of the pupils and thus the amount of light reaching the retina. We chose this name to show that Irida will allow WSN users and researchers to see what is going on in the network. My paper describing IRIDA in detail was accepted to be published during the 4th International Workshop on Performance Control in Wireless Sensor Networks which will take place in Hangzhou, China on May 18 2012. I have also published a website which contains even more details about the protocol, including open sourced material that was used to develop and test it, which are described in the paper. You can find the website here. 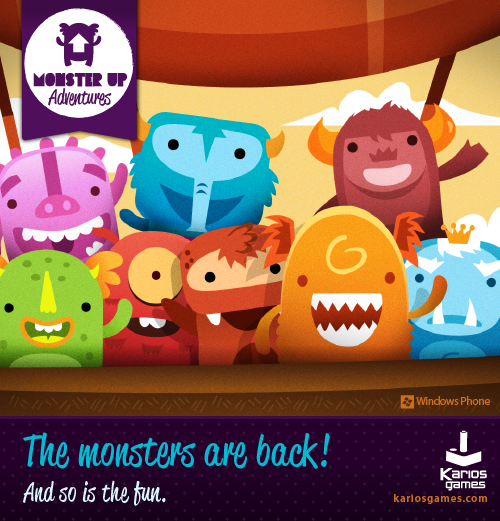 MonsterUp Adventures is the upcoming sequel to out monster hit game forWindows Phone, MonsterUp. It is very close to being released, and the beta program will start some time next week. We are really confident that the game will also be a huge hit with MonsterUp fans and new users alike, and it seems like more people agree with us. Today, MonsterUp Adventures won first place in Athens, Greece during a Microsoft-Nokia app competition(in Greek here) at Colab Workspace and the game is not even released yet. Skotos, who threaten to cover the island in total darkness. Expect amazing visuals from Ilias Sounas (www.sounasdesign.com), an original amazing soundtrack from composer Marietta Fafouti(www.mariettafafouti.com), boss fights, achievements, online scoreboards, many many unique levels and so much more. The monsters are back … and so is the fun!